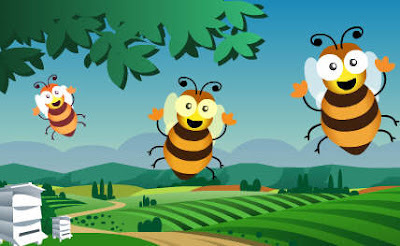 The Soil Association have launched a campaign to save the honeybee click here to find out how you can help! This week we have spent more time in the shed drinking coffee and avoiding downpours than working on the plot. Visits have been infrequent and mainly in order to harvest. Between showers we have managed to do a limited amount of tidying and planting. Surprisingly the bees and butterflies seem to have been a little more resilient than we have been. Their reasons for visiting the plot, however, have echoed our own, i.e. to collect food. I did manage to take July's plot photos too though! Click here to view last week's very short diary entry. 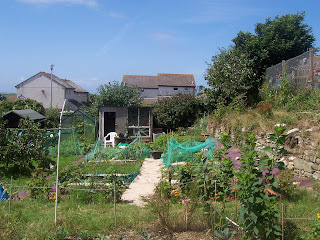 One of the visitors to the website - Natalie - has sent some photos of her new plot in Cornwall. Natalie hopes that her plot should be free from herbicide contamination as she improves her soil with Zoo Poo! Click here to read more about Natalie's plot and view her photos. For a couple of years now we have used the Grow Veg online planner to plan out our plot. 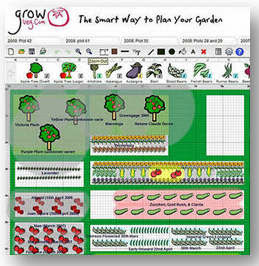 With GrowVeg.com it is easy to draw out your garden plan and decide how best to plant it. The GrowVeg.com planning tool clearly shows how much space plants require and how to group them for maximum success, removing the need to look up planting distances and crop families. It also alerts you if you try and grow a similar crop in the same position in subsequent years. Plans can be printed. As well as offering an online planning tool for a small annual subscription of £15/€13 (There is a North American version too) the website has advice and tips for growing all types of vegetables. A demo of the online planner can be viewed on their website and if you fancy having a go a 30 free trial is also available. 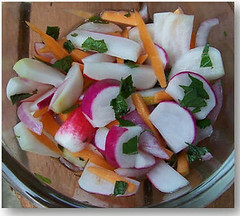 To learn more click on the banner above. 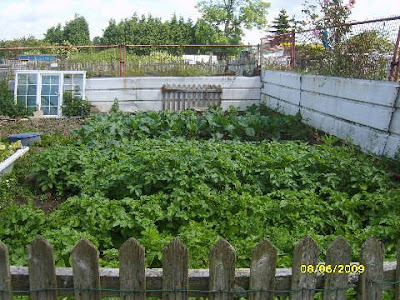 Maggies who took on a plot at Girnhill just over a year ago has sent some new photos of her plot. Click here to see the results of all her hard work. If you want to send photos of your plot and a short explanation of who you are and where you garden then please email them to me and I'll see what I can do. I am still receiving emails to my website from people who have become victims of the contamination and not known that the problem existed before their plants started having problems so I have created an information sheet warning gardeners to be cautious when obtaining manure and to ask the correct questions before obtaining manure. It also has some questions that animal owners should ask their suppliers before supplying manure to gardeners etc. It's a no blame attached leaflet just trying to prevent at least some people from ending up as victims due to ignorance about the problem. I have emailed the sheet to everyone who has visited my website to say they have had problems and asked them to email on to as many people as possible - even non- gardening friends will have other friends who are gardeners - I know people can be annoyed by this sort of email but I am always happy to receive ones warning of viruses or scams so I am hoping people will forgive this and pass on the information. Please keep sending me information if you have become a victim. Everything on the plot is not always rosy!! This week everything on the plot and in the garden has definitely not been rosy! Drama has focused on the poor cardoons which until the strong winds decided to pay a visit were standing proud and tall. Two were completely flattened. If that wasn’t bad enough one fallen plant has flattened some young cauliflower plants that were just recovering from pigeon attack. The bees have lost two of their favourite nectar bars! The tattered leaves of the banana plants are also courtesy of the windy weather. Click here to read the latest entry to the diary. The herbicide will be sold in only large containers to make the product over expensive for casual users. It would be illegal to pass on any of the chemical for use by someone else who isn’t a registered user and has received appropriate training. Names of suppliers/users are to be kept on a database which should mean tracking misuse is easier. This list would be made available to authorities investigating cases of misuse. Information on the instruction leaflet to be more rigorous for instance any manure produced must be disposed of on the site and not passed on to anyone else. Summary of information in picture format will be attached to the container. Contract sprayers will have to sign up to the stewardship as with any supplier, and inform the farmer of the restrictions and ensure the farmer signs the stewardship document. Contractors will have to sign up to all the restrictions that a distributor would. They would also need to get the sign-in of the farmer client. The product will only be approved for the grazing market. It will be illegal to make hay or silage from the grass. This will be highlighted in the stewardship document that the farmers signs. 3.1.1 Members considered further information requested following discussions at the 337th Meeting on 12 May 2009. 3.1.2 After consideration of this information, the ACP advised that approvals could be reinstated subject to the rigorous conditions of the stewardship scheme which would stop the supply of manure containing residues and provide testing advice and equipment, as well as a removal service for any remaining manure containing residues on allotments or gardens. 3.1.3 The Committee noted email correspondence from allotment holders received prior to the Meeting, and discussed methods of providing information and reassurance. It was agreed that the ACP would produce a press release in addition to any action by CRD if their advice is accepted by Ministers. So who's babies are they? Unless they are extremely lucky all brassica growers must have come across this scene. But is this a reason for disliking all butterflies? So which butterfly is to blame for this devastation? Click here to find out and read about its life story. Click on the image or here for more information of what is on offer. Has the CRD done enough to publicise the problem with manure? "I can assure you that much is being done by the various parties involved to bring this matter to the attention of the general public. The Chemicals Regulation Directorate has publicised this issue through its website (http://www.pesticides.gov.uk/), by replying to enquiries via its Information Section, and by being interviewed on Gardeners' Question Time. They have also recently published a leaflet for garden centres and other gardening organisations". My concern is that people only find out about the need to be careful when obtaining manure after they have been affected - i.e when they are searching for answers as to why their plants are dying! People need to be forewarned so they don't obtain contaminated manure in the first place. So where did you learn about the problem and when and do you think enough publicity is being aimed at the general public? Please make a comment on this post to express your views. Have you seen any leaflets in garden centres etc? To say that this week is July it has been a disappointment and visits to the plot have more or less been to harvest in between showers. We have had lots of heavy rain which has pounded the soil. On our clay soil once the sun, (the shiny thing that is sometimes seen in the sky), dries the surface it can crack and become hard and lumpy. With this in mind I have spent lots of time hoeing the surface and turning the soil in areas where we have walked when harvesting. There is no doubt that crops are growing well and enjoying the conditions far more than we are. The weeds as usual are also thriving. Weeding is more a case of damage limitation than clearance. As soon as a patch is cleared, up pop all the weeds again, at the moment they very much have the upper hand. We have had some gaps in what the weathermen refer to as showers when we have managed to get out and do some work on the plot. The rain stayed off long enough for the grass paths to be mown which always improves the look of the plot. 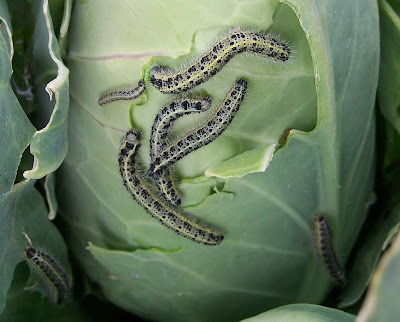 The most excitement this week was centred on the brassica beds. We have always had problems in getting any decent curds on our cauliflower plants. This week we noticed curds beginning to develop in quite a few of the caulis so the leaves have been bent over to stop the curds from yellowing. If you have any other ideas for seasonal vegetable or fruit recipes that you think would be good to share on my website email me the recipe and a photo. It's the height of summer and pouring down! The grass needs cutting on the plot but it is pouring down so time has been spent starting the July diary instead. No doubt the rain is doing lots of good work. It's just a pity that the weeds love it as well. All the work done at the weekend in removing weeds and the things will be germinating again. It is as though the plot fairy has waved a magic wand this week, Everything seems to have shifted a gear and catapulted itself into growth. With very little space left in which to plant we are now very much weeders and gatherers. And of course it has begun - the great courgette season and as usual any delicious recipes will be most welcome. If you have a recipe that you would like to share on the website then please email me with instruction and a photo of your dish. Any other yummy fruit or veggie recipes would also be welcome and if suitable will be included on the website here. Blight was responsible for the Irish potato famine and the period of starvation, disease and mass emigration that followed. It is the dread of anyone who grows potatoes or tomatoes - one minute you have healthy looking plants and promise of a good crop and then the next all the hard work and careful tending has come to nothing! When our allotment site was relatively derelict we rarely suffered from blight but now that the site is fully occupied this problem has increased in severity. Blight is a fungal disease whereby spores are spread by wind and rain. From June onwards is the period when potatoes and tomatoes are most likely to become affected. The condition for spread of blight is known as a Smith period. This is a period of at least two consecutive days where the minimum temperature is at least 10ºC and on each day there are at least 11 hours when the relative humidity is greater than 90%. The potato council operates a blightwatch service click here. They have 300 blight scouts walking potato fields over the growing season and reporting on any sitings of blight. Blight regional maps are available for viewing on their website click here which show where blight has been sited. Watering potatoes or tomatoes in such a way that wets the foliage can artificially produce a Smith period. Brown patches on leaves are the first signs that blight has affected your crops. The leaves will then curl up and wither. The problem can be that other potato/tomato problems may display similar symptoms. There are photos of blight affected potato and tomato plants here, here here and here. You can also buy a testing device to check for blight from here. Blight can be a sneaky problem as it can lurk on seemingly perfect fruit or tubers. Tomatoes that appear unaffected can start to rot five days after they have been picked. It's almost impossible to prevent blight but there are precautions that can be taken. Avoid planting potatoes and tomatoes in the same areas in two consecutive years as spores can be present in the soil. Leaving affected leaves and stems lying around can also increase the chances of passing the disease on. Earthing up can make it less likely that the spores will infect the potato tubers. Another alternative is to grow early varieties of potatoes that will mature before blight conditions prevail or to try some varieties that are supposed to have some degree of blight resistance. If anyone has any experience of varieties that have seemed to weather the blight storm please share your experiences by posting a comment. A protective fungicide can be used but this needs to be applied before blight is apparent and spraying has to continue every 10 days after the first application. If your potato plants do succumb to blight then remove and burn the affected foliage - it is possible that the spores may not have reached the potato tubers. After removal of the foliage leave the tubers in the ground for at least two weeks. During this period spores on the surface will hopefully be killed and lifted potatoes may avoid being infected. Once lifted you will need to keep checking the tubers for signs of blight and dispose of any that become mushy or have dark patches on the skin. Tomatoes grown in greenhouses are afforded a little protection from wind borne spores, however if spores do enter the greenhouse the disease will thrive in the warm humid conditions. It is also extremely likely that tomatoes will be grown in a greenhouse year after year and so any spores remaining in the soil may be more likely to spread the disease from one year to the next. Removing the bottom leaves of tomato plants can help in that plants can be watered directly on the roots thus avoiding any splashing onto the leaves. After today's rain, I guess for now it is just a matter of sitting tight and keeping everything crossed. Potato Council quick reference for disease, disorders and pests that affect potatoes.